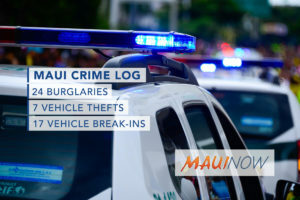 Maui police responded to 15 burglaries, 10 vehicle thefts and 29 vehicle break-ins in Maui County over a seven day period from Feb. 3 to 9, 2019. 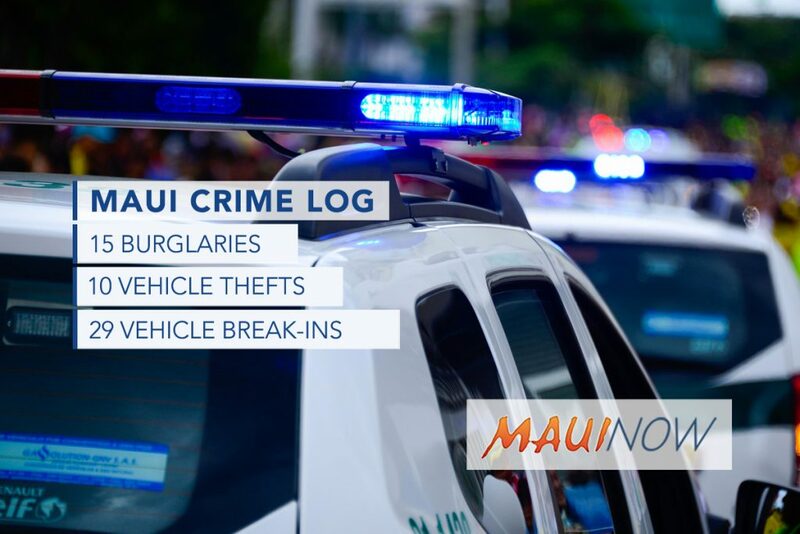 Burglaries were up, vehicle thefts were down, and vehicle break-ins increased from week before levels. Burglaries were up +36% from the week before when 11 incidents were reported over the seven day period. Vehicle thefts decreased -28% from the week before when 14 incidents were reported; and vehicle break-ins increased +11% from the week before when 26 incidents were reported. Of the 10 vehicle thefts reported, four have since been recovered. Tuesday, Feb. 5, 8:08 a.m.: 100 block of S Wākea Ave, Kahului. Non-residential, attempted burglary. Sunday, Feb. 3, 12:59 p.m.: 100 block of Walaka St, Kīhei. Residential, unlawful entry. Tuesday, Feb. 5, 9:59 a.m.: 2200 block of S Kīhei RD Kīhei. Non-residential, unlawful entry. Friday, Feb. 8, 4:23 p.m.: 300 block of Ohukai Rd, Kīhei. Non-residential, unlawful entry. Tuesday, Feb. 5, 12:38 a.m.: 600 block of Wharf St, Lahaina. Non-residential, unlawful entry. Wednesday, Feb. 6, 7:46 a.m.: 800 block of Front St, Lahaina. Non-residential, unlawful entry. Sunday, Feb. 3, 4:48 p.m.: 3100 block of Maunaloa Hwy, Hoʻolehua, Molokaʻi. Residential, forced entry. Friday, Feb. 8, 3:20 a.m.: 100 block of Hāna Hwy, Pāʻia. Non-residential, forced entry. Monday, Feb. 4, 9:51 a.m.: 300 block of Pāʻani Pl, Spreckelsville. Residential, forced entry. Monday, Feb. 4, 11:37 a.m.: 300 block of N Market St, Wailuku. Residential, forced entry. Monday, Feb. 4, 12:10 p.m.: 300 block of N Market St, Wailuku. Residential, forced entry. Wednesday, Feb. 6, 6:11 a.m.: 300 block of N Market St, Wailuku. Residential, forced entry. Wednesday, Feb. 6, 7:27 a.m.: 300 block of N Market St, Wailuku. Residential, unlawful entry. Wednesday, Feb. 6, 8:20 a.m.: 1800 block of Makahala Pl, Wailuku. Residential, unlawful entry. Wednesday, Feb. 6, 8:10 a.m.: 1600 block of L Main St, Wailuku. Non-residential, unlawful entry. Tuesday, Feb. 5, 1:01 p.m.: 275 Kaʻahumanu Ave, Kahului at QKC on Sears side between Sears and parking structure. MHL770 2001 Nissan Nissan, green. Friday, Feb. 8, 10:05 a.m.: 300 block of E Ahuliu Wy, Kahului at Premier Restoration Hawaiʻi. 183MDH 2008 Chevrolet, white. 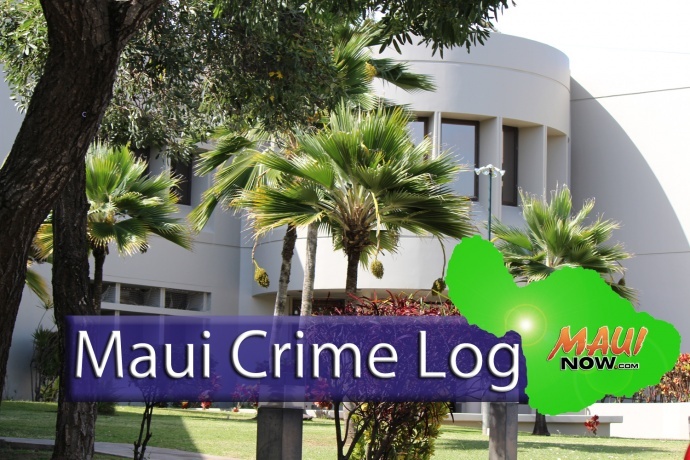 Friday, Feb. 8, 10:05 a.m.: 300 block of E Ahuliu Wy, Kahului at Premier Restoration Hawaiʻi. LJD614 2018 Toyota Tacoma, gray. Friday, Feb. 8, 7:04 a.m.: 200 block of Kaʻahumanu Ave, Kahului at the Queen Kaʻahumanu Center. NGD292 2003 Nissan Frontier, white. Friday, Feb. 8, 5:12 p.m.: 500 block of E Uahi Wy, Kahului. SPU542 2004 Toyota Tundra, white. Thursday, Feb. 7, 8:45 a.m.: 1000 block of Mahanani Pl, Makawao. LJV860 2005 Nissan Murano, gray. Wednesday, Feb. 6, 6:38 p.m.: 600 block of Kakakaua St, Waiehu. LFR558 2016 Honda Accord, white. Wednesday, Feb. 6, 6:38 p.m.: 600 block of Kakakaua St, Waiehu. CVUR6 2007 BMW 335, gray. Sunday, Feb. 3, 7:20 a.m.: 100 block of Kumulāʻau ʻŌhiʻa Lp, Wailuku. MGC222 2000 Toyota Tacoma, silver. Tuesday, Feb. 5, 7:29 a.m.: 724 L Main St, Wailuku at Uptown Automotive. MAN103 1995 Toyota Corolla, blue. Tuesday, Feb. 5, 2:19 p.m.: Hāna Hwy / Oili Rd, Haʻikū. 1987 Toyota 4RN, blue. Wednesday, Feb. 6, 1:17 p.m.: 12250 Hāna Hwy, Hāna at Puaʻa Kaʻa State Park. 2018 Hyundai Santa Fe, blue. Wednesday, Feb. 6, 4:06 p.m.: 12250 Hāna Hwy, Hāna at Puaʻa Kaʻa State Park. 2017 Dodge Caravan, silver. Sunday, Feb. 3, 5:19 p.m.: 1 Lānui Cir, Kahului at Kahului Airport. 2013 Ford F15, white. Sunday, Feb. 3, 7:37 p.m.: 32 Hoʻokele St, Kahului at Planet Fitness. 1999 Ford Ranger, green. Monday, Feb. 4, 7:37 a.m.: 400 block of Kea St, Kahului. 2013 Ford F15, white. Monday, Feb. 4, 8:34 a.m.: 100 block of Nākiʻi Rd, Kahului. 2019 Toyota Tacoma, gray. Wednesday, Feb. 6, 9:24 a.m.: 260 Hāna Hwy, Kahului at Jim Falk Nissan. 2008 Nissan XTR, white. Thursday, Feb. 7, 5:34 a.m.: 400 block of W Papa Ave, Kahului. 1990 Toyota, red. Saturday, Feb. 9, 4:30 p.m.: Haleakalā Hwy / Hāna Hwy, Kahului. 2011 Toyota Tacoma, gray. Monday, Feb. 4, 3:31 p.m.: 13800 Kahekili Hwy, Kapalua at Mile 38. 2019 Kia Sorento, maroon. Monday, Feb. 4, 3:31 p.m.: 13800 Kahekili Hwy, Kapalua at Mile 38. 1999 Honda Civic, silver. Tuesday, Feb. 5, 9:04 a.m.: 13200 Honoapiʻilani Hwy, Kapalua at Mokule’ia “Slaughterhouse” Beach. 2010 Honda Civic, silver. Tuesday, Feb. 5, 10:21 a.m.: 13800 Kahekili Hwy, Kapalua at Nākālele Pt. 2018 Nissan Sentra, white. Friday, Feb. 8, 2:33 p.m.: 1900 S Kīhei Rd, Kīhei at Kalama Park. 2007 Ford, white. 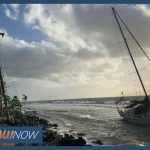 Friday, Feb. 8, 9:35 a.m.: 132 Māʻalaea Rd, Māʻalaea at Māʻalaea General Store. 2009 Mercedes M35, silver. Tuesday, Feb. 5, 4:57 p.m.: 100 block of Pāmakani Pl, Makawao. 2002 Ford F15, gold. Monday, Feb. 4, 9:22 a.m.: 3959 L Honoapiʻilani Rd Nāpili at Kuleana Resort. Nissan Altima, gray. Saturday, Feb. 9, 8:40 a.m.: 3750 L Honoapiʻilani Rd, Nāpili at Leinani Apartments. 2005 Subaru Baja, white. Sunday, Feb. 3, 9:43 p.m.: 142 Hāna Hwy, Pāʻia at Charley’s Restaurant and Saloon. 2017 Dodge Charger, white. Monday, Feb. 4, 9:53 a.m.: 1389 Hāna Hwy, Pāʻia at Hoʻokipa Beach Park / Upper parking lot. 2018 Dodge Caravan, white. Tuesday, Feb. 5, 7:01 p.m.: 1389 Hāna Hwy, Pāʻia at Hoʻokipa Beach Park. 2017 Mazda MZ3, white. Friday, Feb. 8, 6:06 a.m.: 2800 block of ʻIolani St, Pukalani. 2013 Ford, white. Wednesday, Feb. 6, 9:07 a.m.: Kealakai Pl / Nonohe Pl, Spreckelsville at “Baby Beach. 2006 Toyota Corolla, silver. Monday, Feb. 4, 4:33 p.m.: 11600 Kahekili Hwy, Waiheʻe at “Olivine Pools.” 2018 Nissan Sentra, white. Sunday, Feb. 3, 5:31 p.m.: ʻĪao Valley State Park Rd, Wailuku within the parking lot. 2018 Nissan, silver. Monday, Feb. 4, 7:33 a.m.: 1816 Mill St, Wailuku at S & S Apartments. 2006 Chevrolet, Colorado, white. Wednesday, Feb. 6, 4:59 a.m.: 300 block of Kalua Rd, Wailuku. 2002 Toyota Tacoma, red. Friday, Feb. 8, 8:22 a.m.: 1900 block of Kamaile St, Wailuku. 2000 Toyota Corolla, gold.